For coffee and tea needs, there's no question that The Coffee Bean & Tea Leaf (CBTL) always comes as one of the top choices. They've been known for their innovation from being the first to offer Original Ice Blended Drink and Tea Latte to being a pioneer in handcrafted brews made at home with the CBTL Single-Serve Beverage System. Wanting to make #everydayextraordinary, CBTL came out with their latest innovation and unique dining concept called the 26th St. Bistro by The Coffee Bean & Tea Leaf. It's their version of a full-service restaurant that offers an expanded range of unique and distinctive menu items, complete with breakfast, lunch, and dinner selections, as well as desserts, all-day snacks, including imported wines and beers - all on top of their signature coffee and tea offerings. I was able to try some of their best-selling menu items earlier this month and was pleased at how each dish was given careful attention to details in taste and texture. Heads up though, these are only tasting portions - the actual orders are way bigger! 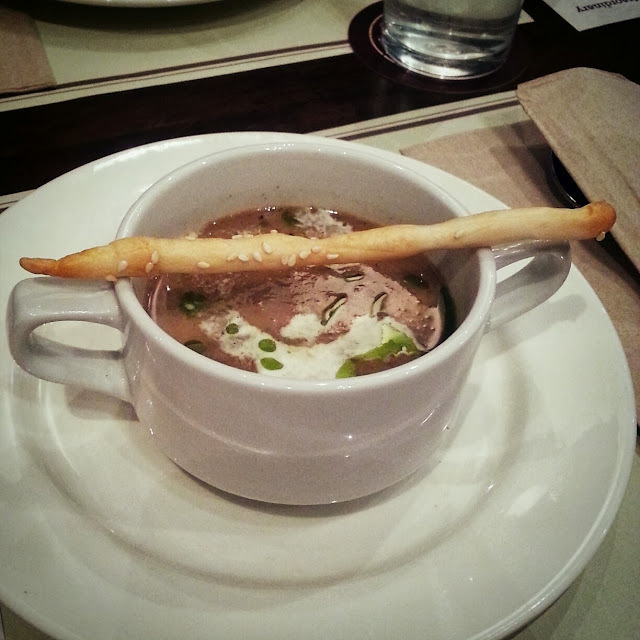 For starters, I had the Wild Mushroom Soup. It's a thick and flavorful soup made with three kinds of mushrooms: button, shiitake, and portobello. It was love at first taste! The mushrooms mixed with spices, blended with the right creaminess gave it just the right balanced flavor. I actually wanted to ask for more! Nomnomnom. 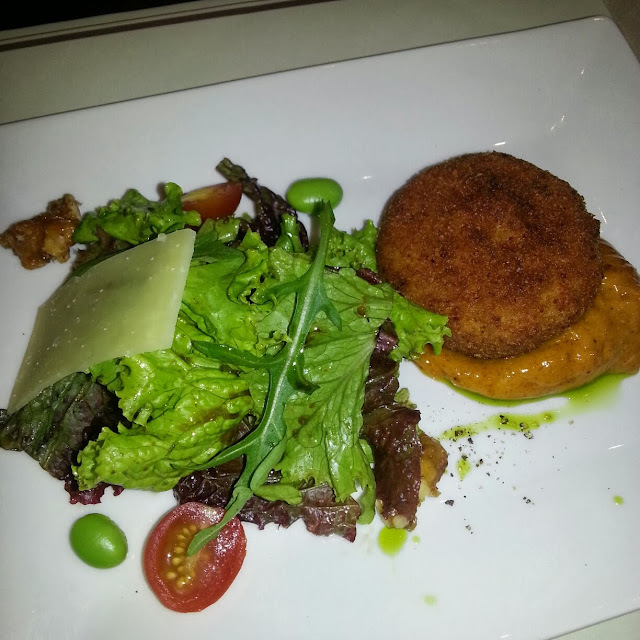 On to some seafood, the Salmon Fiashcakes & Greens dish was fantastic! It was a pan-friend Norwegian salmon cake served with smoked paprika aioli and mixed greens, drizzled with balsamic vinaigrette. In all honesty, I hate cooked salmon as much as I love salmon sashimi, so this dish was a make or break for me. Surprisingly, it didn't have the malansa taste that has been preventing me from eating salmon. Pasta time is Tiger Prawn & Shiitake Mushroom Linguine. 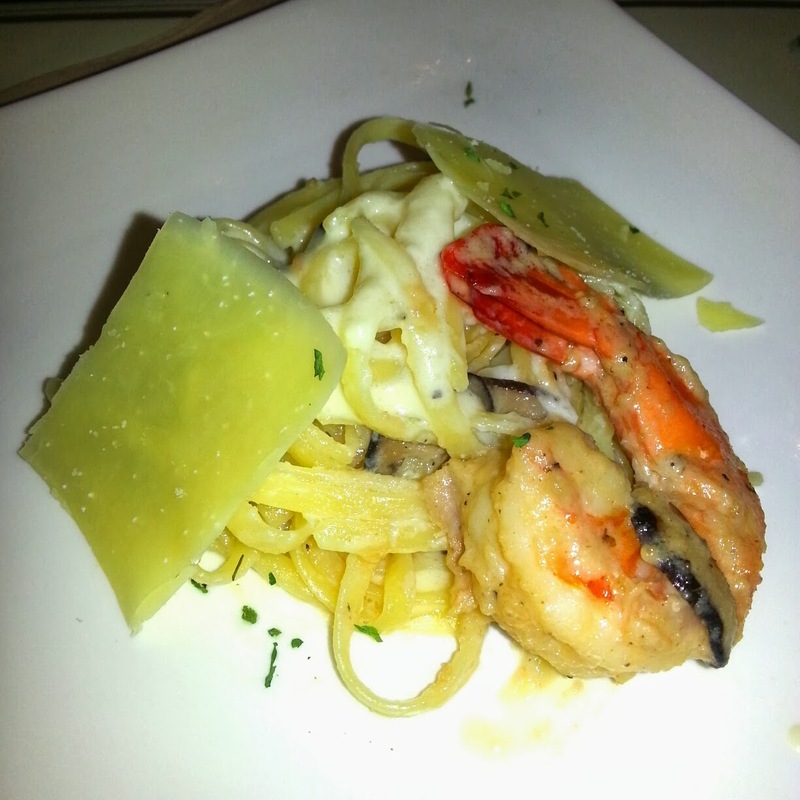 It's a white sauce-based linguine pasta served with seared tiger prawns and shiitake mushrooms. The pasta was cooked just right, but the overall dish was just okay. I was looking forward to a bigger prawn too. Some meat this time, the Hanging Tender Steak with Potato Gratin and Marsala looked promising. The meat was tender and juicy, but the taste isn't something I'd look for every day. I liked the potato gratin though as it was crunchy on the outside due to it being baked. What's a meal without some desserts? I had Chocolate Lava a la Mode and Apple Crumble a la Mode. 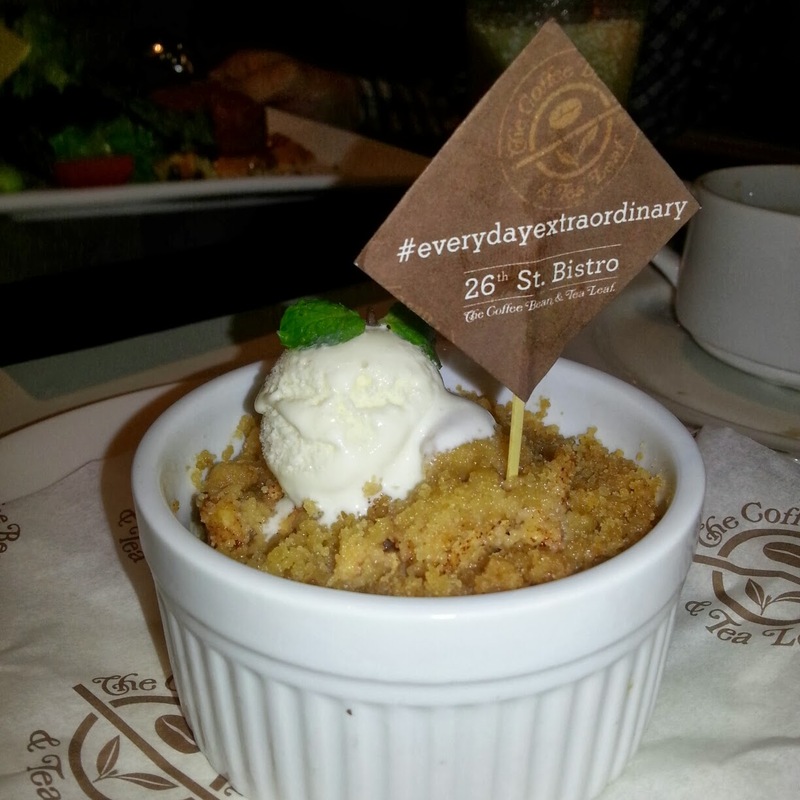 The chocolate lava was just okay for me, but the apple crumble made its way to my sweet tooth fantasy world. It tasted good without being overly sweet. A good cap to a great meal. With a location that's very easy to find and an ambiance that's very inviting, cozy, and romantic, dining at The 26th St. 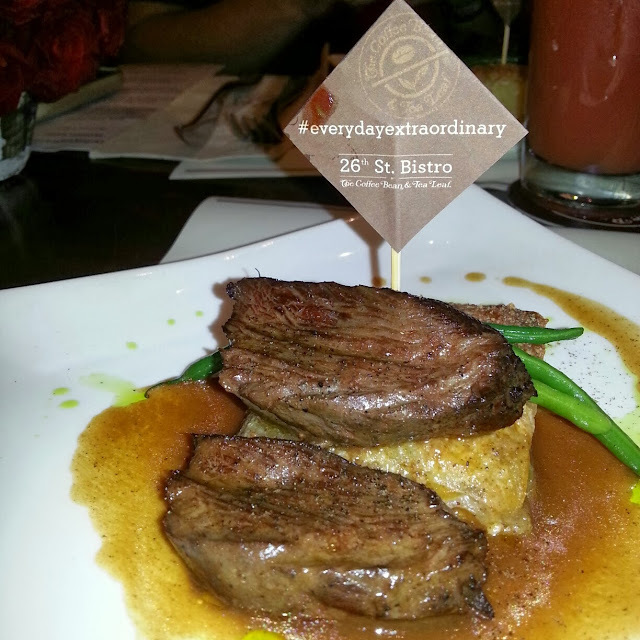 Bistro by The Coffee Bean & Tea Leaf will make you churn Php300-500 per person inclusive of drink. For people living in the south, the nearest branch would be at the ground floor of Net Lima in 26th St. and 5th Avenue, Bonifacio Global City. Meanwhile, the people living in the opposite direction can enjoy the fusion of food at the 5th level of Shangri-La Plaza Mall's East Wing.